We count ourselves very lucky to have fabulous staff here at Anstruther Fish Bar. Many of them, like Beth, have been with us right from the very start and we are now into double figures with the number of staff who have received their 10-year loyal service award. We’re sure many of you will know Beth’s face from our restaurant as she has worked on the Monday-to-Friday day shift for many, many years. After celebrating her 70th birthday, Beth decided she didn’t want to leave us, but instead cut her shifts down to three days, then recently two days, each week. She openly admits that the busy summers here in the restaurant were getting harder every year. Being on your feet for six hours, bending and stretching with heavy trays and running up and down stairs during a shift is tough for anyone, but (in typical Beth fashion) she handled the stress and pressure very professionally, without complaint. As we all say, who needs gym membership during the summer? Just get a job with us – it’s a full workout each shift! 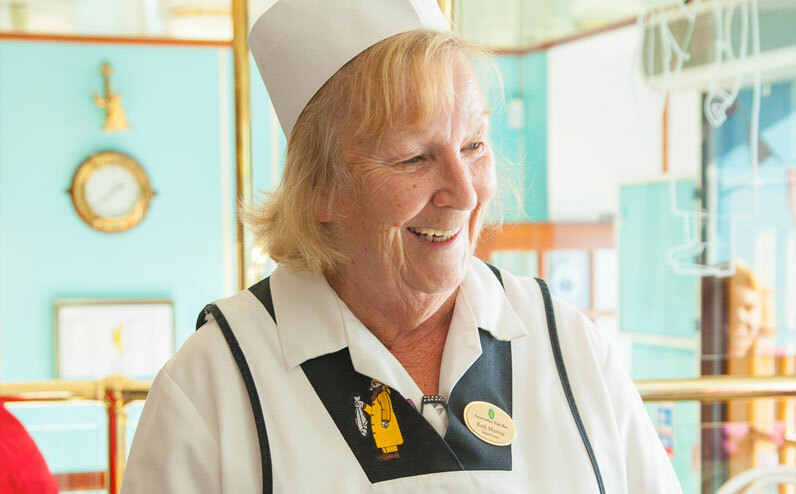 We were naturally upset to learn that Beth had decided to hang up her apron for the last time at the end of last year, but it was a very well-deserved retirement after all Beth’s years of hard work and loyalty. We have shared many laughs together over the years and have enjoyed her company at all our staff parties (and there are LOTS! ), on numerous staff outings and, not least, our trips down to London for the UK Fish and Chip Shop of the Year Awards. We are already missing her (and her wicked sense of humour) in the restaurant, but hope she enjoys spending time with her friends and family and ‘doing a bit of travelling’ as she has planned. And of course, we’re sure she’ll be popping by for a grilled smoked haddock at some point too! We all wish Beth a very happy retirement – and have given her pride of place as the very first staff member to take part in our new regular Employee Spotlight feature.